Twenty years later destiny brings them to a crossroads again, when they no longer know what is right and what is wrong. While both compassion and injustice have the power to transform lives, will the three friends now choose to become sinful criminals or pacifist saints? The Tree with a Thousand Apples is a universal story of cultures, belongingness, revenge and atonement. The stylized layered format, fast-paced narration and suspenseful storytelling makes for a powerful, gripping read. 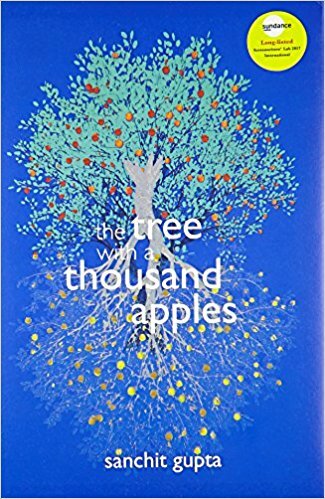 The tree with a Thousand Apples is a story about three childhood friends Deewan Bhat, Safeena Malik and Bilal Ahanagar who lives in Kashmir, Paradise on Earth. Safeena's father Rehman Malik and Deewan's father Praveen Bhat are neighnours and shares a friendly bond irrespective of their different religion. Deewan, Safeena and Bilal are innocent kids who plays together, study together and their eyes are filled with many dreams. The story tells us how the lives of these three innocent school going kids turn into living hell in their own Kashmir, paradise on Earth. On 29th January, 1990 when they witness merciless killings of people in Kashmir, Rehman Malik gives shelter to Bhat family. Kashmiri Pandits felt helpless and they felt like prisoner in their own home, in their own town, in their own state, in their own country. A Muslim family risks their life to protect Hindu family. Safeena sees her mother die in front of her eyes. Deewan's elder brother Ravi, who was an Army Jawan is killed by an unknown militant group. Kashmiri Pandits were seen with suspicion everywhere. The beautiful Srinagar turns into a battleground overnight. After this, Deewan with his family was displaced from his own homeland Srinagar and their only fault was that they were Kashmiri Pandits. Bilals sees her sister molested in front of his eyes and in order to take revenge, he turns into terrorist. Safeena who loses her mother, father and brother Tariq one by one, now loses all hopes in life. She has been kept as captive in Major Choudhary's home. After 20 years, fate brings all three friends together. Deewan become a journalist and poet in Mumbai. He is called back by Bilal to save Safeena's life. Their childhood suffered and these characters unwillingly becomes the person they never wanted to be. To know what happens next in their lives, you'll have to read this book. I loved the writing style of author. The scenic beauty of Kashmir is very well-described by the author. This is a novel which will surely make readers cry and will make them to accept and respect each others religion. This novel makes us think that its us, the people of the country who make it a paradise or living hell by our own feelings of love and hatred towards people of other religion. It made me think about the people who lived in Kashmir and tough life of people who are living in Kashmir, their unimaginable pain and suffering. I hope this book will promote compassion. Lets become more compassionate, more human. The characters feel real to readers. Sad scenes are written really well. I could actually feel the same horrific events happening in front of my eyes and I am unable to do anything to stop them and feel helpless just like the characters of the story. The apple tree in the backyard sees their friendship and their sufferings too. The story is gripping and kept me turning the pages. I feel all the readers will appreciate this book. 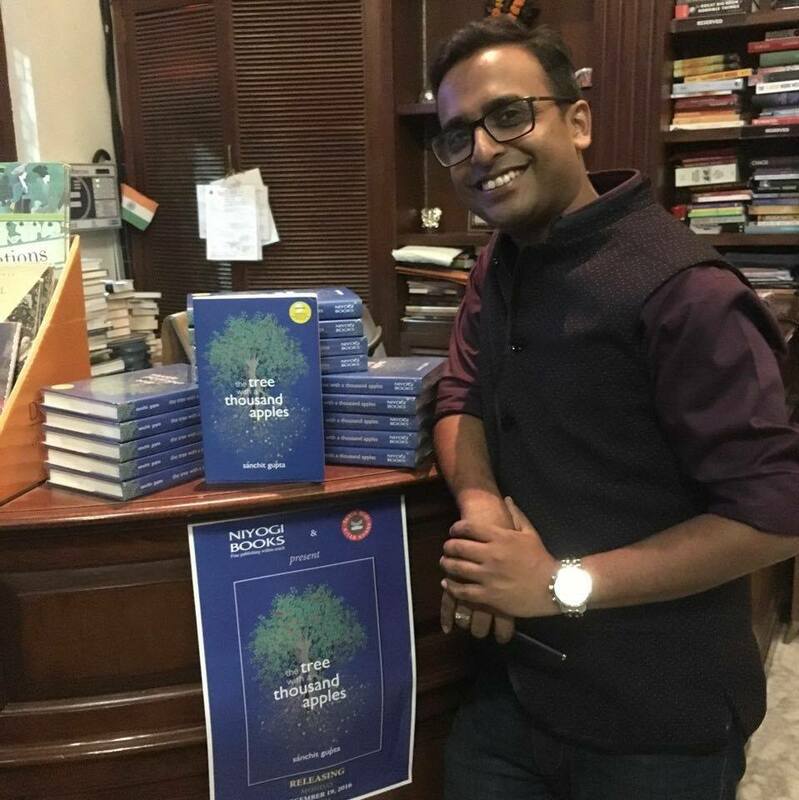 Born and brought up in the hills of Himachal Pradesh, Sanchit Gupta began his career as a part-time copywriter with an advertising agency in Mumbai. He went on to co-found his own theatre group, worked as a freelance film screenwriter and as executive producer–fiction for a leading television network. 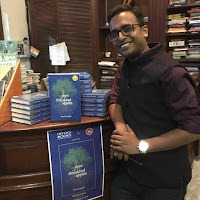 His short stories have been published in several esteemed publications and literary journals and have won acclaim in leading literary festivals and online forums. One of his film scripts (fiction) has been long-listed in a globally reputed screenwriters’ lab. He has worked with All India Radio as a talk show host and regularly features in poetry recitals at Prithvi Café, Mumbai. This is his debut novel. Apart from being a writer, he is a brand management professional with a wide range of brand building and communication development experience across FMCG, automobile and media industries.